News: On March 29 I was informed that Cold Fire was short listed for the Dafoe Literary Award for non-fiction. I am happy and humbled. 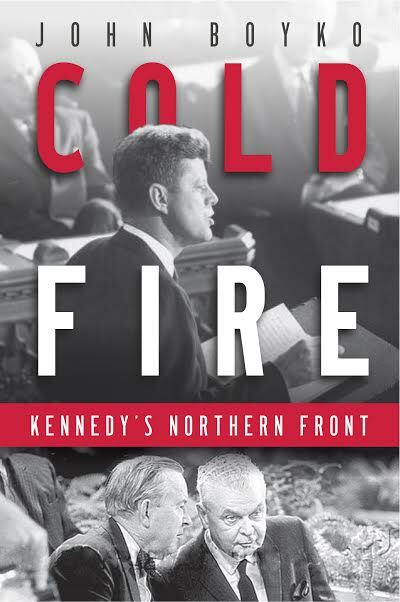 Cold Fire: Kennedy’s Northern Front was published in Canada and the United States on February 2, 2016. In the Mad Men era of madness when we came as close as we had ever come to blowing up the world, the United States and Canada had reached a crossroads. Three leaders pulled their countries in wildly different directions. Conservative Prime Minister John Diefenbaker, an unapologetic nationalist seeking to end the trend toward greater continental integration by bolstering Canadian autonomy and developing an independent identity. Meanwhile, Liberal leader Lester Pearson, the Nobel Prize–winning diplomat, saw value in continuing the slide toward integration. While battling communism around the world, Kennedy never forgot his northern front. He adroitly exploited his enormous popularity among Canadians to seduce its people and pressure its government to bend to his will. He ruthlessly attacked Diefenbaker and shamelessly supported Pearson. Newly released documents present shocking revelations about these crucial years. During the Cuban Missile Crisis, Canadian ships and planes guarded America’s Atlantic coast, while Canada suffered a silent coup d’état. Kennedy pushed a nuclear weapons system on Canada while knowing full well that it was merely a decoy to draw Soviet fire. Kennedy carefully influenced and monitored the overthrow of a Canadian government and the election of another. While Canada helped Kennedy tumble into the Vietnam War he did nothing to stop American inspired violence on the Great Lakes border. Perhaps most startlingly, if not for Diefenbaker, Kennedy may have survived the assassin’s bullets in Dallas. Brimming with sparkling stories, fascinating characters, and fresh insights into this critical moment in time, Cold Fire will astonish readers with the intriguing ways in which the struggles of these three resolute leaders determined the course of the next half-century. “I love how he interweaves Canadian and American history and am amazed at my ignorance concerning the level of tensions between the two countries…While countless books have been written about John F. Kennedy, Cold Fire examines his presidency through the specific lens of his relationship with two Canadian prime ministers – first John Diefenbaker and then Lester Pearson. As might be expected, the book starts with a biography of the three men. What is impressive is the way Boyko extends these biographies to illustrate how the politicians’ backgrounds influenced their personal philosophies…[Boyko’s] perspective should spark readers to consider our past priorities and our future goals.” Quill & Quire, March 2016. Significantly, the election of 1963 was the first time an appeal to stand against American dominance had been defeated. The economic benefits of integration into the American system, it was decided, outweighed the diminution of economic independence that such integration entailed. Boyko acknowledges Diefenbaker’s flaws but is sympathetic to the Tory leader’s nationalism. Boyko’s account of the high politics of this seminal era is excellent.” Winnipeg Free Press, February, 2016. John Boyko has once again written a well-researched and enlightening history that goes beyond superficiality, and that unveils much of the hidden negotiation and conflict that was kept out of the headlines. He presents a fair picture of the main protagonists of this story, fairly analyzing their strengths and their weaknesses. This book is an excellent account of its times, the personalities involved and of the issues confronting the two nations at the time. It is a fascinating read for anyone interested in Canada-US relations, in the Kennedy administration, in Canadian politics in the 60s, in Cold War North America or in the political climate of the 1960s. Boyko has a gift for being able to present history as if it is occurring as current events, to distil and clearly explain complex issues and to present an enjoyable read in the process. It was a great pleasure to read this book and I recommend it highly. Live Journal, March 2016.